Launched during the last edition of Il Cinema Ritrovato in collaboration with the Cohen Film Collection, the Keaton Project completes its second year of activity with restorations of Cops, The High Sign, Seven Chances and The Paleface. We believe that the singularity of the work carried out consists not solely in the end results, but above all in the scientific rigour and the time (a full year) devoted to every stage of the restoration process, from the study of the film and extra-film sources available, the search for materials, to the dating and comparison of over sixty elements that arrived in Bologna from many international archives. In the following texts, we have chosen to document and share the problems, dilemmas and discoveries encountered during restoration. The selection of these four titles neither reflects chronological criteria nor curatorial choice, but was dictated by the progress made in our research. Watching The High Sign, The Paleface, Cops and Seven Chances one can easily identify the seeds of Keaton’s technical virtuosity, acrobatic audacity and surreal features which will be fully expressed in his mature works. 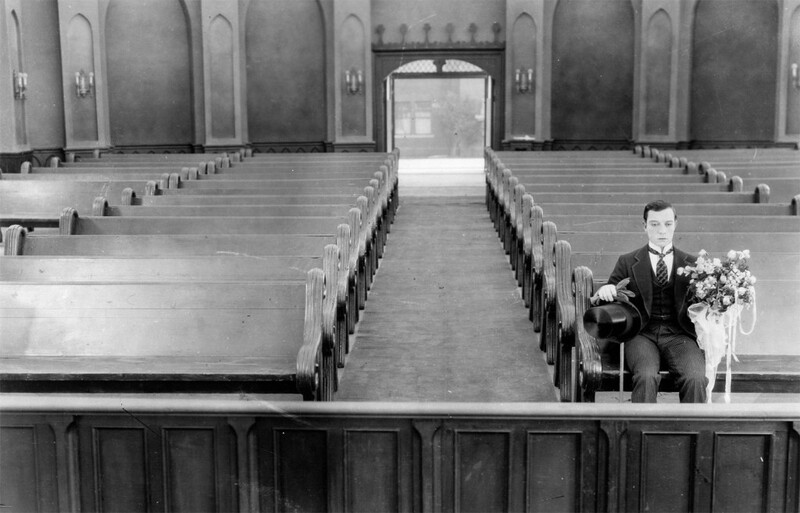 Keaton shows amazing ability to use different registers, to avoid repetition, to stage an apparently unlimited variety of gags resulting from misunderstandings, dramatic events or from catastrophic misfortunes. Despite, or by the very virtue of, their weaknesses and imperfections, these films cannot be considered mere preparatory work – quite the opposite. They reveal all the freshness of a unique creative time when Keaton’s visual genius was vigorously emerging and clearly show what Walter Kerr described as Keaton’s rigorous approach to the film medium, the ‘integrity of the frame’, the notion that the camera must photograph reality without falsification. So we invite you to enjoy these films as you would the first strawberry of the summer, which is never the best but still a delight, confident that in a few years’ time the restoration work will bring complete rediscovery of the full essence of Keaton’s work. Special thanks to: Tim Lanza, Kevin Brownlow, David Robinson, Hooman Mehran, Frank Scheide, John Bengtson and all the film archives which have provided their materials. Our deepest gratitude to Matthew and Natalie Bernstein generously supporting the restorations of The High Sign and Cops. The Music of The Kid composed by Charles Chaplin, restored and adapted by Timothy Brock, performed by the Teatro Comunale di Bologna Orchestra directed by Timothy Brock. The Music of The High Sign composed by Donald Sosin. The Music of Cops composed by Timothy Brock.